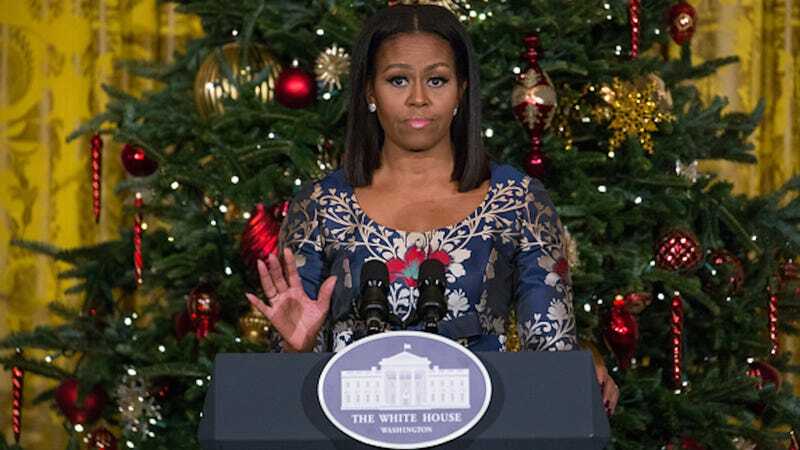 In November, a West Virginia government employee was fired after she composed an egregiously racist Facebook post referring to Michelle Obama as an “ape in heels.” However, on December 23 she will be reinstated. Forgive and forget, I always say! Pamela Taylor, the director of Clay County Development Corp., was removed from her position after remarking, on Facebook, that she looked forward to Melania Trump assuming the mantle of First Lady. Now-former Clay Mayor Beverly Whaling commented “just made my day” on Taylor’s post. She resigned after news of the women’s exchange zipped across social media, spurring waves of outrage. Both women also issued public apologies. But as The Hill reports, Taylor will be back in the saddle on December 23, after what I’m sure was a month of quiet reflection and re-education. It’s no surprise that the CCDC did not want Taylor’s reinstatement to attract attention. However, the Charleston Gazette-Mail learned the news upon filing a records request. And as it happens, many do not want Taylor to be spared meaningful repercussions for hate speech. Protests have begun to appear on the CCDC’s Facebook page. If you would like to contact Taylor’s employer regarding her rehiring, you can find contact information for the CCDC here.